Observation - Camera shy fox - UK and Ireland. Description: I didn't see this fox until it disturbed a couple of pheasants. Unfortunately it remained in cover while it was close - and when it did break cover it ran at full speed. 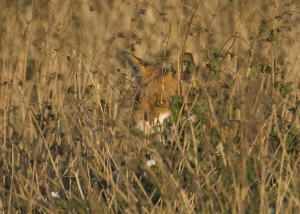 I didn't see this fox until it disturbed a couple of pheasants. Unfortunately it remained in cover while it was close - and when it did break cover it ran at full speed.